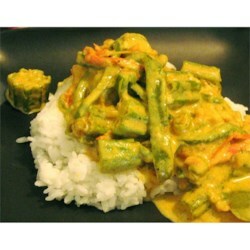 "This is okra in coconut milk curry. Very simple to make and great with rice and naan for a complete meal. A spicy and very creamy vegan curry that will even please non-vegans. If you like more spice, use more peppers or other spices to your liking." Heat the oil in a large skillet; cook and stir the bell pepper in the hot oil until softened slightly, about 3 minutes. Stir the jalapeno peppers, ginger, garlic, and bay leaves into the bell pepper; cook until fragrant, about 2 to 3 minutes more. Season with the coriander, red pepper, turmeric, cumin seeds, cardamom, black pepper, and cinnamon; cook and stir another 2 minutes. Add the tomato slices and raisins to the mixture; continue cooking 3 more minutes. Mix the okra thoroughly into the mixture to coat with the spices. Stir the coconut milk and water together in a small bowl; pour into the mixture. Cover the skillet and cook covered until the okra is tender, 8 to 10 minutes. Add water if needed to keep moist. Season with salt. Serve warm. Make delicious, authentic Indian food at home! I used only 1T oil, then I added onions and some more okra to the recipe. I used ground coconut and water instead of coconut milk. This made a wonderful meal! Used chicken instead of okra and added brown sugar to this. Brown sugar helped the dish a lot. These two definite non-vegans inhaled this! Creamy, crunchy, spicy, sweet, this had it all. This is a Meatless Monday keeper for any day of the week. This was good, but I expected it to be much more flavorful with all these spices; next time I'll add more. came out delicious the first time. I love the balance the raisins bring to the pepper and spices.